Even though my Wife and I have not lived in New England for quite some time, we still embrace some of the nostalgia. Both of our families enjoyed watching The NBC Mystery Movie. This wheel format NBC/Universal joint venture eventually spawned a clone of the umbrella series known as The NBC Wednesday Mystery Movie. One of the three new shows added was Banacek. Although based in “Boston” and heavily Massachusetts Themed, the majority of the production of Banacek took place on the Universal backlot in Los Angeles. There was still enough actual footage of Boston and surrounding areas to have locals feel a strong connection to the program. So yes, Banacek is riddled with nostalgia for us. Not only dedicated complete with theme music, the opener changed slightly on each episode. 1. Banacek got derailed at the start of the Third Season when George bailed on the production to keep a greedy ex-wife from extorting additional funds from their divorce agreement. A perfect example of how one greedy individual can victimize so many people since the show never resumed production and there would have been more shows for all to enjoy if it had. 2. Although well received by industry professionals, Banacek fell short of Columbo’s ratings. The average person could identify with the “Cop” persona of Columbo over the cultured, tasteful, classy and well educated image of Banacek. Columbo dressed like a homeless street bum and Banacek dressed in finery. Columbo drove a Toilet-On-Wheels and Banacek (when not being chauffeured) piloted a 1941 Packard Custom Super Eight One Eighty Darrin Convertible. 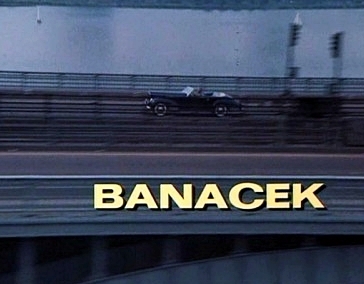 Banacek was truly a program for the One Percent. This entry was posted in The One Percent and tagged Banacek, Boston, massachusetts, Mystery Movie, The One Percent. Bookmark the permalink.